A mother/daughter bookclub in Massachusetts chose Growing Wings for their January selection. Here are the girls, who not only read & discussed the book, but made mobiles for a craft. Sounds like a great group! Thank you, girls & moms. My car is reset from traveling mode. My laundry is done & put away & I'm wearing clothes that I haven't seen for a month. It's good to be getting things put away. I've even written the first draft of a cool picture book. Just typed it onto the laptop, so revision will ensue. While the traveling clothes were tumbling in the dryer, I actually took all the clothes (except the fancy dresses--I have more prom dresses than many women) out of my closet & didn't put them back in unless I really liked them. I guess I've already weeded through the garment population, because I only got rid of a couple shirts & one pair of pants. So why don't I wear more of the clothes? It seems I have tried & true favorites that I come back to again & again. Perhaps the other clothes are the understudies, waiting in the wings for the stars to break a seam or spring a zipper. Buttons I can deal with, but otherwise I'm not much for sewing, or at least haven't been. I am eyeing one shirt, a hand-me-down from my dad, that I would like better if it was more tailored to my form. Perhaps I shall get brave & put darts in the back. If I do, I shall report here. Now, the moment you have been waiting for: a shadowy picture of the chief executive elephant. What is duty of the CEE? Institutional memory, of course. One summer, 40 years ago, I lived in this house outside Custer, Montana, while my dad was working construction. My little brother, only 2 that summer, played naked in the mud puddle in the driveway (being from the rocky part of the Rocky Mountains, we were relatively unfamiliar with the concept of "dirt" & "mud") & would stand up in all his mudcovered glory & yell, "Hi hitchies," to the hitchhikers hoping to catch rides at the nearby Prairie Diner. (We called it the "Prairie Dog.") One of the "hitchies" responded with, "Hi, ya little redneck." Mikol also couldn't say his "k" sounds correctly, so he--& all the rest of us--called it "the Tuster House." The diner (now a bar as well) is still there, although it is now called Fort Custer. I had a cup of coffee & the second-to-last piece of caramel apple pie. I'm soon on the homeward leg of the journey, having holidayed in Montana with my family. A joyous time was had by all, with the exception of several of us, including me, getting a wretched cold. I stayed a bit longer than planned, rather than bringing the cold to people who hadn't already been exposed. But now I've been in Minnesota long enough to hang with Tiffany & Zach & my grand-dogs, Cheese & Mac. Got to visit a bunch of friends here in Rochester & up in Minneapolis. Some OMG great food, especially from a new restaurant on Lake & Lyndale called The Gray House. The menu changes a lot, but the mushrooms are always on it & should NOT be missed. Also, the tea smoked duck at Szechuan Spice (conveniently also on Lake & Lyndale) is extremely delicious. I think tonight we're going out for sushi & beer. Then it will be on the road again. 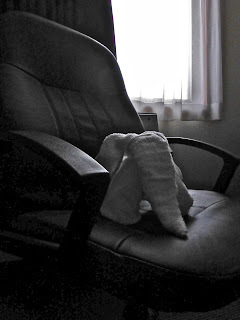 I had a fun stay at the Best Western in tiny Sundance, Wyoming, where the towels had been made into elephants. I guess the head of housekeeping also makes swans & turtles. (Zach says he guarantees she used to work on a cruise ship.) So very fun. I recommend staying there, should you find yourself on I90 between Rapid City, South Dakota, & Gillette, Wyoming, looking for some shut-eye. Sometime soon, after the appropriate photos have been transferred to the computer, I will show you the CEE, or chief executive elephant.